Advanced imaging technologies and the radiologists who interpret the diagnostic images that are produced can play a major role in extending the lives of cancer patients with oligomeastastic disease. As clinical understanding of and targeted therapeutic treatments for oligometastases improve, it is increasingly important for radiologists to describe and delineate every discretely identifiable lesion they see. Oligometastasis is defined as a state of metastatic disease that is limited in total disease burden, with up to five sites, and that is not rapidly spreading to more sites. The limited metastatic growth potential is attributed to the possibility that the cancer cells are in inhospitable target organs, that environmental conditions in the primary tumor are forestalling evolutionary clonal pressure, and/or that the cancer cells do not have the properties necessary to survive body circulation and be able to invade successfully in another organ. Oligometastatic colorectal cancer is most commonly found in the liver and the lungs. Lesions identified in the liver can potentially be treated with surgery or thermal/radiofrequency ablation, and such treatments may be curative. The authors emphasize that it is essential for radiologists to carefully examine the liver for any suspicious lesions when performing cross-sectional imaging of a patient with colorectal cancer, and to scrutinize images for lung nodules, precisely identifying their locations. 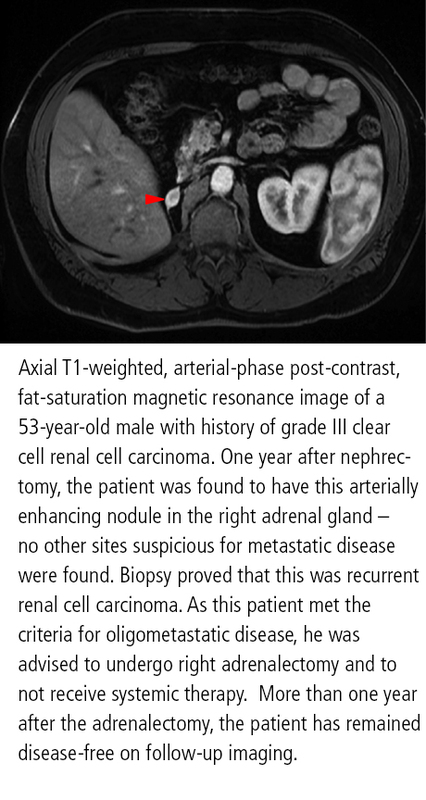 Radiologists reviewing images of patients presenting with an indeterminate renal mass for staging or patients with renal cell carcinoma being restaged should look for metastatic disease in the adrenal glands, lung, skeleton, muscles, and lymph nodes. Late recurrence often occurs in the pancreas and can also arise in the stomach. With respect to prostate cancer, stereotactic radiotherapy and salvage lymphadenectomy are treatments being used with oligiometastases. The authors recommend that radiologists focus on the pelvis and retroperitoneal lymph nodes when evaluating the images of a patient being staged or restaged. The most common site of oligometastases from sarcomas is in the lungs. Therapy is well established, and includes wedge resection, lobectomy, stereotactic radiation, or percutaneous ablations. The authors note evidence that patients survive from initial and repeat local treatments. This survival rate is not as robust for patients with oligometastastic non-small cell lung cancer, but their lives may be prolonged with surgical resection and/or radiation therapy. The authors are hopeful that continuing technological improvements in CT, MRI, and molecular imaging modalities with respect to spatial resolution and in image processing software will enable radiologists to improve their ability to identify all sights of metastatic disease. They encourage radiologists to actively participate in research whose outcomes will be to optimize the selection of patients for aggressive therapy of oligometastases. “We are at a time when improved imaging can dovetail with a better understanding of oligometastatic tumor biology, so that radiologists can assist in guiding potentially curative treatments for cancer patients,” commented Dr. Rowe to Applied Radiology. Reyes, DK, Pienta KJ. The biology and treatment of oligometastatic cancer. Oncotarget. 2015. 6;11:8491-8524. Rowe SP, Hawasli H, Fishman EK, et al. Advances in the treatment of Oligometastatic Disease: What the Radiologist Needs to Know to Guide Patient Management. Academic Radiology. Published online January 15, 2016. Radiologists can play pivotal role for patients with oligometastatic disease. Appl Radiol.